Most genealogists and family historians these days are familiar with a variety of search engines used to locate information on the Internet. These include Google, Bing, and Yahoo as well as specialty search engines such as Mocavo. The process is pretty straight-forward: you enter your search terms and you get back a list of links to relevant websites. But what if there were a search engine that allowed queries in the form of a question and, in fact, preferred that format? You could classify the resulting search engine as more of an answer engine than anything else. And what if you could take the concept one step further and have this answer engine also calculate information based on set input parameters? Great concept, right? 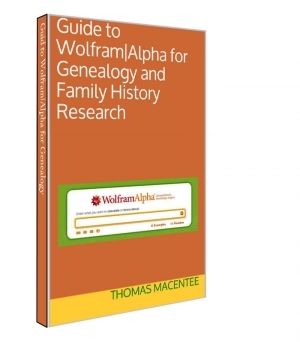 Well such a search engine does exist: Wolfram|Alpha (http://wolframalpha.com). What sets this computational knowledge engine apart from other search engines is the ability to pull data from external sources (meaning websites outside of Wolfram|Alpha) that are curated (meaning selected for their data reliability and sources).